Figure A1.6 Sequence of chemical bases making up the DNA within the gene with any gene. The genes are the hereditary recipes, passed down from generation to generation, just like recipes are in some families. 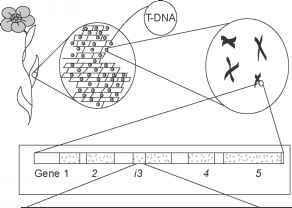 How do these stretches of DNA store information? Let's look more closely at a portion of DNA for one of the genes. 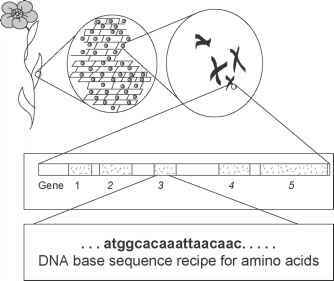 Figure A1.7 Translation of base sequences into amino acids make up all DNA molecules. The DNA can be extended by adding more of these bases, or reduced by lopping some off, hence the variation in length of DNA in cells of different species. The particular sequence of bases conveys the information to the machinery of the cell, which then builds a particular protein, conceptually the same way a food recipe provides directions to compile a particular meal. Continuing the recipe analogy, the four base "letters" in DNA language are analogous and comparable to the 26 "letters" in English. The letters in each language can be arranged in a particular sequence to give meaning. In English, the specific sequence of letters builds words and sentences; in DNA the letter sequence spells out a call for particular amino acids and the construction of a protein composed of a specific sequence of amino acids. For example, Figure A1.7 shows the DNA base sequence at the start of gene 3 is ATGGCA. ... 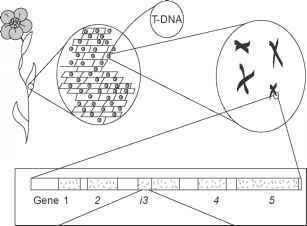 In DNA language, all "words" are three letters long. The first word in this sequence, ATG, translates as the amino acid methionine. The next word is GCA, which calls for the amino acid alanine. When the cell machinery reads gene 3, it follows the recipe by finding a methionine floating around the cell, and connects to it an alanine molecule. The next word, CAA, calls for glycine, so the cell finds and attaches a glycine molecule to the methionine and alanine already connected, thus building an elongating chain of designated amino acids. An average gene is about 1000 bases long, or 330 genetic "words," which means a protein chain consisting of about 330 amino acids. The particular sequence of amino acids gives the protein its particular features, which in turn give the cell and ultimately, the organism, a particular trait. Some proteins are very short, simple chains of amino acids, others are long, complex, composed of several amino acid chains or are further modified prior to activation. Human insulin, for example, is a fairly simple protein composed of two amino acid chains, one is 30 amino acids long, the other 21 amino acids long. 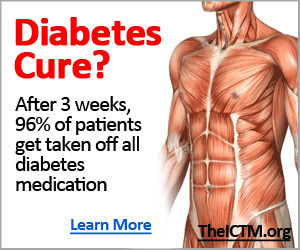 (Many other animals also generate insulin. Some, like rat insulin, is almost identical to human insulin. 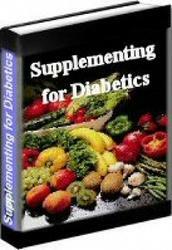 Until recently, human diabetics were treated with bovine or porcine insulin, as it is similar enough to human insulin to do the job.) In any given cell, there are approximately 10 000 different proteins. Many are enzymes, helping perform various chemical reactions. In genetic engineering, the DNA carrying the gene recipe for a desired trait is copied from an organism that has the gene and is conveyed into the plants (or other) cells on a small circular piece of DNA called transfer DNA, or t-DNA. 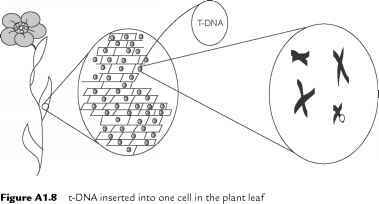 There are several methods to deliver the t-DNA to plant cells, in each case the natural cell mechanism is responsible for inserting the t-DNA into the native DNA. The exact technical mechanism is unclear. However, the process is a cellular one, in that the t-DNA is delivered to many cells at a time, but only some cells successfully integrate the t-DNA into their own genome. 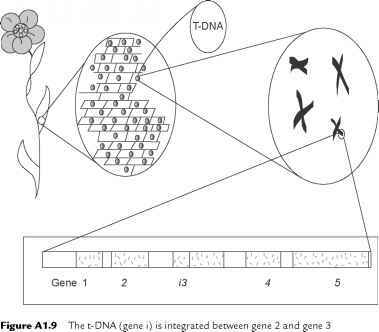 This is illustrated in Figure A1.8, showing the t-DNA being inserted into only one cell in the plant leaf. If we now magnify that "transformed" cell, we can conceptualize the inserted t-DNA (abbreviated i, for insert) as having been integrated between gene 2 and gene 3 (Figure A1.9). Now, when we magnify and read the inserted DNA (gene i), we see the same four DNA bases (ATC and G), but the sequence is different from that of gene 3 (Figure A1.10). In this case, gene i starts with the same ATG as gene 3, but then has bases GCC and subsequent bases are also different (Figure A1.11). tryptophan and so on. This is a new amino acid sequence, resulting in a new protein, providing the plant with a new trait, depending on the function of the new protein. The new trait may confer resistance to a disease, or it may provide a new nutrient, or a new industrial protein. The gene itself, the physical piece of DNA, is simply baggage in the transfer procedure.